An effective online exercise and lifestyle program that supports and empowers you to reach you health and fitness goals. The Coco Motion Mumma Online Bootcamp features short, sharp, effective workout's that can be done in the comfort of your own home with minimal equipment. Guaranteed to get you moving your body, burning unwanted fat and feeling fabulous in your skin. As a mum I am very well aware that there are only so many hours in the day. That trying to fit in a workout, in between taking care of kids (and husbands), work and all of the other extra curricular activities that there are as a family can be challenging. I also know how hard is after having kids to shift your weight and get back to your pre-baby weight and shape. I am certainly aware of the challenge to regain your fitness and participate in activities you used to do without ending up a sweaty mess. I also know what it is like to want to rip your skin off because it feels so uncomfortable being it. It has taken me years and many failed attempts but I have finally figured out how to get my body to burn fat and build muscle. With minimal, time, space and equipment. I want to share how to do this with you. How I am now the fittest I have been in my adult life. The answer is not in giving up, it is in participating in the Coco Motion Mumma Online Bootcamp! Your time to get your health and fitness on track, feel fabulous in your skin and be glowing role models for your children. 1. An initial 15 minute consult with me over the phone or over Skype to establish and set realistic, achievable and measurable goals. 2. I will email you a weeks training program every Sunday so that you can schedule it into your week. Be prepared to workout 5 days a week. 2-3 High Intensity Interval Training Session (which will include strength training) which can be done at home. As well as planned Cardio sessions. I don’t want you to give up any running, swimming or cardio classes you are already doing. 3. You will have access to videos of movements that may be unfamiliar or you may be unsure of. 4. I will guide you through a live workout each week on Periscope. If you can’t make it at the set time, no worries it will hang around for 24 hours. 5. Access to an exclusive group of like minded Mumma’s who will be along for the same journey. Where you can share your wins, struggles and gain motivation, support and accountability. 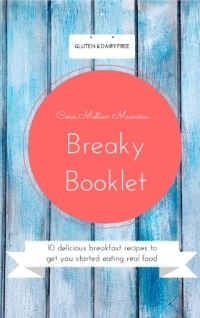 * A copy of my Coco Motion Mumma Breaky Ebook - 10 delicious Real Food Recipes to make sure you are starting the day off right. * A copy of my Monthly planner for you to display on your fridge or in your home to show the rest of the family when your are unavailable due to “Mumma Boot Camp time”. * Weekly prizes. For each time you post in the secure Facebook group you will gain an entry into the draw for the weekly prizes. I have some awesome giveaways ready for you! This program and lifestyle shift is going to have you feeling fabulous in your own skin, clothes fitting better, as well as improved energy ready to run rings around your family. Are you ready to get your Health and Fitness on track for 2016? Are you ready to get this Boot Camp started? Invest in yourself and your own health. Commit and results will follow. "You are a wonderful coach and wellness champion Coco Motion Mumma." "Sometimes I think you can read what my body needs in advance, lovely session and I was able to work through it and push myself." "Great workout, really challenging and I got a real sweat up. Loved it." "I'm definitely fitter and more motivated to keep on this path of better fitness and fun since starting bootcamp. Thanks for inspiring me to make the positive change." " Session are great and so easy to navigate." I am so passionate about you becoming Heart-Fully Healthy that I am going to limit the group so that I can give you the support your deserve. So Click below to get started. Bootcamps commence on the 1st of each month. - Revamp your health and fitness. - Feel fantastic in the skin your in. - Be an incredible role model to your children. - Be a part of a motivated online community committed to you becoming Heart-Fully Healthy. - Workout in the comfort of your own home. - Receive Healthy Recipes, Motivation and Support. Awesome! Once you have clicked 'Yes! Count me in' head over to your 'Cart' at the top right hand corner your screen.